One of the biggest mistakes we can commit when we have garage doors is to fail to check whether all parts are functioning properly or not. Sometimes, we often wait for a major issue to pop out before we actually call for help for all necessary repairs. Visual inspection is fairly easy to do and can be performed just once every two months to make sure everything is alright. To help you spot these mistakes, we are listing the most common ones for you. This means that a simple movement can cause it to open or close immediately. You have all the reasons to be alarmed when this is the case since this implies that your garage doors are not as secured as you want them to be. The reason for this? The torsion spring can be broken. For bigger doors, one of the springs may be broken. There are instances too when the lifting cable may already be breaking. A possible cause will be the fact that the hinges may have come lose causing the door not to fall in its usual place. When the hinges are loose then there is a tendency that the horizontal tracks are not aligned and the bolts or metal bracket are unscrewed. Sooner or later, when you do not pay much attention to this concern, there is a tendency that the door will be unscrewed causing much more trouble in the long run. When worse comes to worst, this can be a reason for your doors to hit your garage that is silently sitting in that area. You can always tighten lose screws but any problem worse than this will require you to call an expert. The common scenario is there are times when you can easily open the door but there are also times when you can hardly open it. 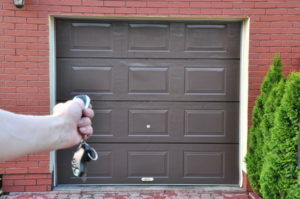 If your garage door is remote-controlled then the controller may just need battery replacement. This can also happen when your door is very old and has not been replaced since it was installed. Commonly, garage doors that have been installed before 1993 will need garage door code replacement by this time. This is especially true if your garage door operates using a photoelectric backup system. This is one where sensors are found on both sides of the door. When you are having a hard time closing the door or you have mixed chances of closing it successfully, the problem is that the sensors have probably been misaligned. The door sensors will need adjustment in this regard. You might be laughing at this problem but you have to admit that sometimes you panic when your garage doors are remote-control operated and there seems to be a power outage in your neighbourhood. It is either you stay at home and not go out when this is the case or wait outside in case you left home before the power failure took place. What if it takes hours? In this case, you have to learn to manually operate your garage door. It is very important to anticipate any problems that may take place when using your garage doors. It is your responsibility to check on this spot from time to time. When you have spotted any trouble, you can always do some steps on your own. But remember that there are cases when you will need the help of experts. For quality garage door repair in Toronto, just give us a call!